Too often we read Scripture without concentrating on what we are reading and therefore miss completely what God has to say to us. We read quickly without delving into the depths of what has been written. We need to read God’s Word slowly, thoughtfully, incisively with a desire, not only to understand what is being said, but to seek to apply to our lives the truth or principle before us. With this, we need to have eyes to see, ears to hear and hearts open to respond to all God wants to reveal to us. The Holy Spirit has been given to us, not simply to dwell within our hearts, but to teach and give us discernment to understand His Word and make it a reality in our daily walk. 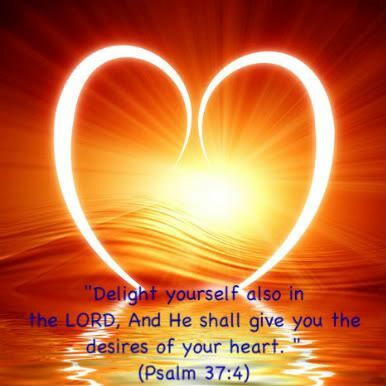 What do you think it means to “delight yourself in the Lord?” We quickly read the following words “and he will give you the desires of your heart” without realizing this promise is to those who “delight themselves in the Lord.” So let us see what it means to delight ourselves in the Lord. First, “delight” means to find great joy and pleasure in someone or something. If we are to delight ourselves in the Lord we will have to withdraw from the base desires we have in the things of this world that hinder, distract, and impede the focus of our hearts on Christ. Paul admonished the believers in Corinth to “Come out from among them and be separate…touch no unclean thing, and I will receive you” (2 Corinthians 6:17). We cannot delight in the Lord when a divided heart contaminates our lives. God responds to a clean heart and pure spirit that is bent to being filled to overflowing with His Spirit. The major thrust of our heart must be to fix our desires on HIM. We must cultivate the habit of a holy intimacy with the Lord. This takes discipline on our part responding to the Holy Spirit as He seeks to draw us unto the Lord. Ask the Holy Spirit to give you a hunger and thirst to know the Lord in a new and living way that will bring you into this personal intimate relationship. It will be the joy of your heart and the love of your life. When we are receptive and responsive to the Holy Spirit, He will create in us a peace that passes human understanding, a joy that is unspeakable and full of glory with a desire for the Lord that will enable HIM to give us the desires of our heart. When God is the desire of our hearts, our seeming disappointments will be His appointments to prove anew His grace and mercy to us. He becomes the sufficiency for all our need “according to his riches in glory by Christ Jesus” (Philippians 4:19). Fear, anxiety, and apprehension are lost as we rest and abide in His care and compassion. God wants to encompass our life with His presence and power. His virtues, attributes and works should be ever before us and spur us on to an abandoned faith in the One who is “the same yesterday, today and forever.” Looking steadfastly to Jesus will create a deeper admiration of who He is and elicit our allegiance, reverence, and respect. It is then we will know the joy and peace from finding our delight in the Lord. The resources of His grace are infinite.